How marketers are seeing the advertising potential of the Easter holiday? When it comes to marketing and advertising, Easter has never really had the potential for generating revenue, but this is, perhaps, about to change. According to a survey by NFR, consumers were projected to spend just under $16 billion for Easter related items this year ($2.6 billion going to candies, $2.2 billion to gifts and $2.6 billion to flower and decorations), however, marketers are increasing their spending by 34% when it comes to Easter related TV ads. In a word, marketers are increasing their budgets, while consumers are spending less on presents. That is to say, they are trying to change the advertising power and potential of spring holiday and consumer behavior, and to spark shopping trends. Although the survey showed the behavior of Americans, we can, however, see that brands around the world are trying to attract more consumers as well. That being said, let us peak into this year’s commercials and advertising that are trying to attract our attention, and to reshape Easter’s advertising potential (perhaps). 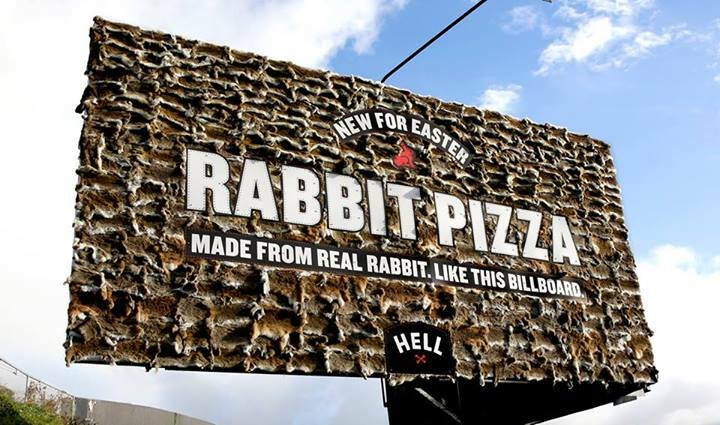 It seems that with this attention-grabbing Hell Pizza billboard in New Zealand, rabbits are about to lead their way into a new form of advertising. The board is made from hundreds of rabbit skins with a rather clear massage: “Made from real rabbits. Like this billboard.” While many of us may be disgusted just thinking about hundreds of little dead rabbits, New Zealand in fact suffers from an abundance of rabbits that can bring havoc to crops and the ecosystem. If you are concerned, you shouldn’t be. “We sourced these rabbit skins via a professional animal tanning company, who in turn sourced them from local meat processing companies where the skins are a regular by-product,” they explained on their Facebook page. The pizza is, however, very delicious, according to some. This year Asda created a cute commercial, to say the least. They launched “Something to Tweet About” ad introducing funky dancing chick and included a social media campaign as well which invites fans to create their own “Asda Chick” and share via #AsdaChick hashtag. This adorable chick dances to the disco classic Funky Town, showing that it is “clearly 10% funkier than the others” which means Asda will always be 10% cheaper than Tesco, Sainsbury, and Morrison. Although these cute animal dancing commercials are perhaps overused lately, this chic surely is a show off, in a good way. Embracing on Easter tradition, Target created a rather interesting commercial offering a new meaning to Easter egg hunt. In Alice in the wonderland atmosphere, a little girl trades her Easter basket for a shopping trip. Although the girl is cute, and the idea is simple, it seems that the main attraction of the commercial is the song, irritating for some and adorable for others. See it for yourself, and decide whether you can keep watching it for 30 seconds. This year we were certainly surprised by one particular idea one cannot say that is specifically targeted on increasing shopping trends, however, it is launched just on time for Easter thus this is the first reason that it deserves to be mentioned. The second reason is that, looking at the larger picture and given that the marketers are trying to revive Easter as a family shopping holiday, the ad does target the parents. It is GoldieBox “This Is Your Brain on Engineering” spot that calls on the parents to rethink the princess culture, to put it in the simplest way. Moreover, it may be not that appealing to potential kid consumers at all. Showing the positive effects of exposing girls to science and engineering, the brand is trying to influence on grownups with this brilliant ad. Although many brands have some sort of marketing strategy for Easter, it seems that we will need to wait for a few more years to see if and how the marketers are going to attract our attention during this spring holiday, and hopefully see some great advertising.